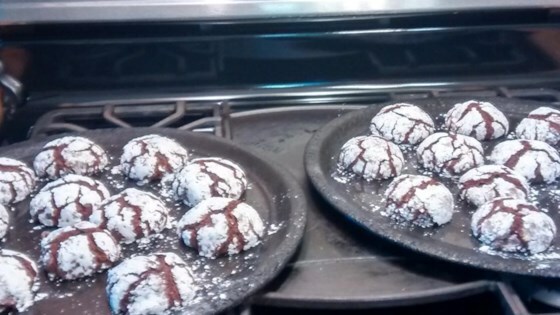 "This is a cookie recipe that I got from my mother and have never been able to find anywhere else, they are a yummy dark chocolate cookie"
In a large bowl, cream together the shortening and sugar until smooth. Beat in the eggs one at a time then stir in the vanilla. Combine the flour, cocoa, baking powder and salt; stir into the creamed mixture. Stir in walnuts if desired. Cover dough and chill for at least one hour. Preheat oven to 350 degrees F (175 degrees C). Roll the dough into walnut sized balls. Roll the balls in confectioners' sugar. Place the cookies 2 inches apart onto the cookie sheet. Followed recipe exactly turned out really nice. A little bitter for my taste, but people at work seemed to really like them! Wonderful! Cant say anything bad about this cookie! This was an old recipe of my mothers that I had misplaced. I was thrilled to find it on the internet. Thank you, Thank you ! !